This castle with feathers cake is another creation from our friends across the pond – Hockleys Cakes. And honestly, it might be my favorite cake of theirs to date. 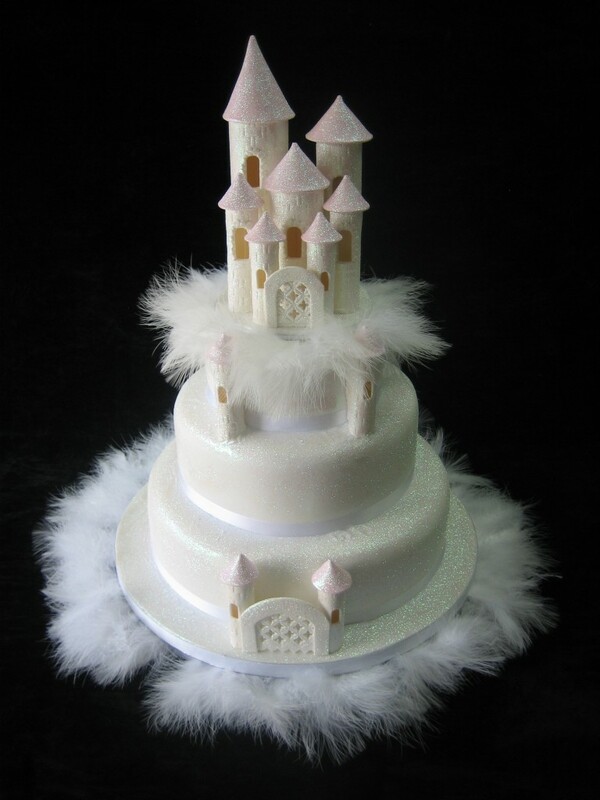 I am a huge fan of all things “princess-y” and so this cake with its castle turrets and elegant castle gate is something I would have loved at my own wedding. Michael Hockley said this cake was the first time Hockleys created a cake for a wedding that was completely themed around a fairy tale. The wedding’s venue was decorated so that everyone felt as if they were inside a fairy tale, and I bet this cake was the perfect centerpiece for that romantic world! I love the elegance and simplicity of this cake – with just three tiers and lovely, sparkly icing it is the epitome of fairy tale romance. Of course the feathers around the top and bottom tiers are the perfect finishing touch. If you’re a fan of romance and fairy tales and all things sparkly, I’m going to be that you love this cake as much as I do! Another huge thanks to our friends at Hockleys Cakes for sharing their creations with us!